Who needs Black Friday? Not PC gamers, that's for sure. 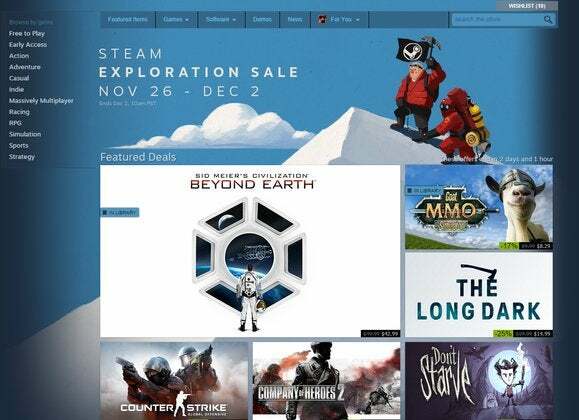 As expected, Steam launched its Thanksgiving sale today, termed the "Steam Exploration Sale." The sale will run November 26 through December 2. Steam's Thanksgiving sale, like the Halloween sale last month, is typically just a stopgap between the larger Christmas and Summer sales. That doesn't mean it's devoid of good deals though, with brand new games like Civilization: Beyond Earth and The Evil Within selling for 30 and 66 percent off, respectively. Company of Heroes 2 is also 75 percent off, in case you're looking to snag the base game cheap in wake of the new Ardennes Assault expansion. The game also ties into the recent Steam Discovery Update—thus the "Exploration Sale" moniker. There's a section titled "Your Exploration Sale" that pulls games specifically recommended for you based on what you play and what's in your library. It's a pretty neat feature, though the first game it recommended to me is a free-to-play game so... not really taking advantage of the "sale" aspect. And there's also a very handy button towards the bottom where you can easily see everything on sale today, which is great if (like me) you enjoy sorting by lowest price and picking up some absolute garbage games at fifty cents a pop. Bad Rats: The Rats Revenge, here I come.